Jack Atherton, who lived on Branchville Road, had three great passions in his life. He combined two, art and fishing, into a book that has become a classic. His third passion was his wife, who wrote the book’s introduction and who often fished at her husband’s side. John Carlton Atherton was best known for that first passion: He was an artist who created scores of magazine covers enjoyed by millions, whose paintings are in major American museums, and who with the likes of Norman Rockwell founded the Famous Artists School. Atherton was born in Minnesota in 1900 and served in the U.S. Navy during World War I. By 1920, he was in California, studying at the College of the Pacific and what is now the San Francisco Art Institute. In 1929, he won the first prize in the Bohemian Club’s annual art exhibit, enabling him to move to New York City where he entered the world of commercial art. There he gained a reputation while producing advertising art for General Motors, Shell Oil, Dole, and others. His notoriety nationally increased when he did a striking poster for the 1939 World’s Fair, depicting the Earth in the lap of Liberty. In 1941, as America was preparing for war, the Museum of Modern Art awarded him first prize in a National Defense Poster Competition, sponsored by the government. His painting, Buy A Share in America, showed a handshake in front of a factory. He went on to do many posters for the war effort. It was during World War II that he began producing magazine covers for Saturday Evening Post, His first, “Patient Dog.” done in a Norman Rockwell style, shows a loyal dog watching over the hunting equipment and the framed picture of his owner in uniform. While he did covers for Fortune, Holiday and other magazines, he was best known for his more than 40 covers for Saturday Evening Post, including the famous Ben Franklin quotation series that began in 1944 and continued annually until 1961, just before his death. Levy Gallery in New York in 1938; Levy represented him throughout the 1930s and 1940s. His work was considered Magic Realism. “This new work primarily consisted of symbolic, often bleak landscapes that were becoming a favorite subject of the new surrealist movement in America,” said one biographer. His paintings are in the collections of many museums, including the Metropolitan Museum of Art, the Museum of Modern Art, the Whitney Museum, the Art Institute of Chicago, and the Wadsworth Atheneum. 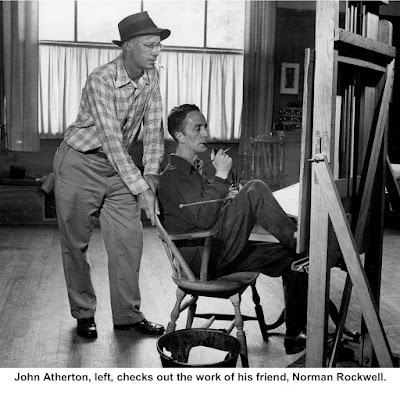 In 1948, Atherton was among the founding faculty of the Famous Artists School, created by a group of members of the New York Society of Illustrators. 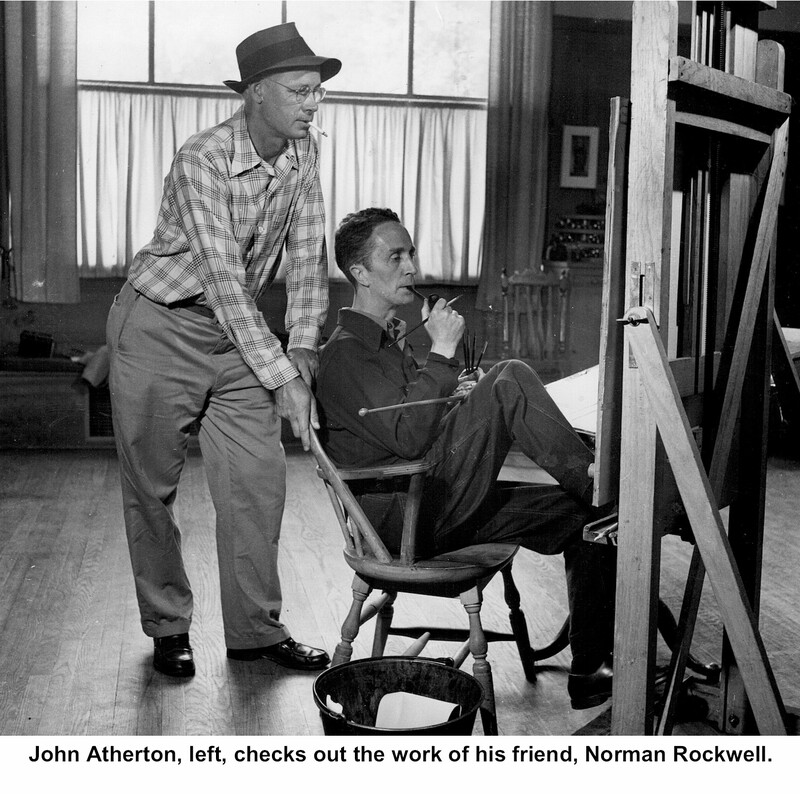 Other founders included Norman Rockwell, who did 322 Post covers, and Robert Fawcett, a fellow Ridgefielder. When Atherton was a boy, he loved to go fishing, a sport he grew to love more as he got older. He fished with some of the best anglers in North America and wound up writing a classic book on fly fishing, “The Fly and the Fish,” still in print more than a half century after his death. Maxine Atherton said that when they lived in Ridgefield, her husband became close friends with Harold “Pinky” Gillum, the Ridgefielder who “built marvelous flyrods and refused to produce them in mass production, so there are relatively few in existence. Each rod he made of especially selected bamboo and with a specific angler in mind. I know a man who compares his Gillum trout rod to a Stradivarius violin. “Pinky and Jack enjoyed many a day fishing together, and I recall Pinky saying that he would rather sit on a bank and watch Jack cast a dry fly than fish himself. And it was fly fishing at a favorite spot on the Miramichi River in New Brunswick, Canada, with his wife near his side, that Jack Atherton died of a heart attack in 1952 at the age of 52. “Jack, who was too young to die, had frequently said that when his time came, he hoped it would be when he was in fishing waders,” Maxine Atherton said.